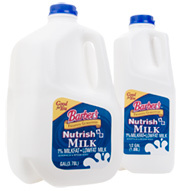 Barber’s Dairy new Nutrish A/B and Plus ABC milk are the result of extensive study and research concerning the available nutrition in milk. Research shows that certain types of bacteria can be beneficial for us to consume. The Nutrish A/B is the blue labeled 1% milk pictured to the right. In the name, “A” stands for acidophilus and the “B” stands for bifidum, both active cultures in the milk. These cultures serve as a sort of “probiotics” in our bodies promoting health by aiding in digestion and potentially enhancing the immune system. 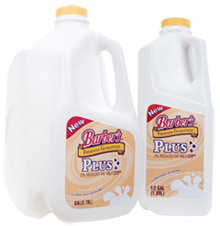 The yellow labeled milk to the left is Barber’s new Plus ABC, a 2% milk. It is complete with both of the A and B cultures mentioned above PLUS calcium. Calcium is also very important to include in our diet for building strong teeth and bones. Be sure to feature both of these new Barber’s items in your dairy case. More detailed nutrition information is available upon request. 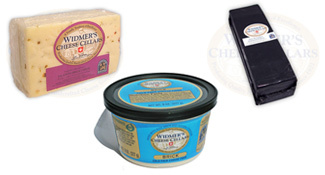 Joe Widmer is a third generation cheesemaker of Widmer’s Cheese Cellars in Wisconsin. He specializes in his award winning aged cheddars, colby blends, and pungent brick cheese. For all three cheeses there are different flavor combinations or age categories. Most all products are available in both loaves for foodservice and small chunks for retail. These products have a wide variety of applications: serve cubed as an appetizer, shred into a casserole, slice for a burger, eat as a snack! Call us for more information about these items. Copyright © 2009 Butler Foods of Pensacola, Inc. All Rights Reserved.